Every red-blooded motorcyclist dreams of making the Big Trip - the Adventure Motorcycling Handbook is the comprehensive manual to make that idea a reality. This fully updated and re-designed sixth edition is packed with essential advice and practical know-how on the vital preparation for undertaking a long journey off the beaten track. · Trans-continental route outlines – across Africa, Asia and Latin America, plus back-country riding in South-West USA, North-West Canada and the Australian Outback. 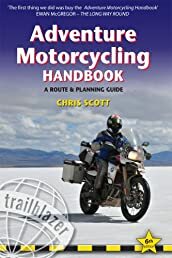 · Practical information – documentation, preparing your bike for touring off the beaten track, shipping and air-freighting, navigation and survival, off-road riding techniques in deserts, mountains and even rivers! · Tales from the Saddle – a dozen first-hand accounts of spoke-bending biking adventures worldwide. Adventure Riding Techniques: The Essential Guide to All the Skills You Need for Off-Road Adventure Rid.. The Essential Guide to Dual Sport Motorcycling: Everything You Need to Buy, Ride, and Enjoy the World'.. The World's Great Adventure Motorcycle Routes: The Essential Guide to the Greatest Motorcycle Journeys.. Adventure Motorcycle Maintenance Manual: The Essential Guide to All the Skills Needed to Maintain and ..